Ink has been on my radar for months. I liked the cover, the setting and the plot. So there I was, reading this book I so eagerly waited for but when I was a quarter in I felt like giving up on it solely because of the infuriating insta-love (I'll get to that -prepare yourselves). Halfway through the book though the story was finally getting somewhere and it was such a relief! In a nutshell Ink is about blonde American Katie (everything about her screams foreigner! ), who moves to Japan after her mother's death. There she struggled to adjust to her new life in a country that barely speaks English. She meets Tomohiro, who's basically the center of all the hullabaloo in the story, and her life is turned completely upside down. I liked that readers are immersed in the unique Japanese culture all throughout the story. This is probably what I liked most about Ink. There were Japanese words in the dialogues and interesting tidbits about Japan. I enjoyed reading Katie's trips to the nearest conbini (convenience store) and hanami (cherry blossom viewing) with her friends and their bentous. It was all so colorful and fun! Another aspect of the Japanese culture that was used in the book was the Kami (Japanese gods). I didn't know much about Japanese mythology prior to reading this so I was really impressed at how the author was able to explain and blend everything nicely. The Japanese backdrop definitely set Ink apart from most young adult books today. I also enjoyed Sun's imaginative storytelling a lot. I thought the pacing was good and the action scenes were well written. I especially liked how vivid the descriptions were for the scenes with ink and sketches coming to life. It was interesting picturing Tomohiro going crazy over his sketches and the ink that's trying to take control over him. Sun took an entirely unique concept and gave it life with her flawless writing. Inasmuch as I enjoyed all that, I had a big problem with one aspect of the book: the romance. Ink reminds me of all the Japanese (and Korean) dramas they show here, as far as the romance is concerned. There's the gorgeous, mysterious and ultra-snobby (and slightly bipolar) leading man. And then we have the spunky female lead who's charm is her stalker tendencies. I think I've watched enough asianovelas to see the same pattern applied in this book. The guy is so obnoxious but for some weird reason the girl keeps chasing after him. After some really awkward run-ins, the guy finally finds her attractive... because she's "different." Japanese drama, check. It annoyed me to no end how big of a stalker Katie was. She repeatedly wondered about Tomohiro (even before they started talking) and why he's so hot-and-cold and she did all sorts of crazy stalker things to get answers. She even climbed a tree to "challenge" him! I don't usually use gifs but... I had to. To be honest, I'm all for stereotypical Asian drama because I have a soft spot for those but for a love story to take over a large chunk of a book that's not primarily a romance is too much. It was out of place most of the time, especially when Katie would over think about Tomohiro and their relationship in the most inconvenient situations. Now is not the time! The love story took over so Katie was, well, obnoxious most of the time too. Katie's personality in the first half of the book was the biggest thing I didn't like about Ink. The verdict. Did I like it? Yes, after the 60% mark. The action really kicked off then. Do I want to read the next book? Hell yeah. There's so many questions left unanswered and they're enough to make me want to read book 2. For example, and this is probably the biggest question of all: What is it about Katie that attracts the ink? I'd like to know more about that in the sequel and hopefully we'll get more ink action than drama. 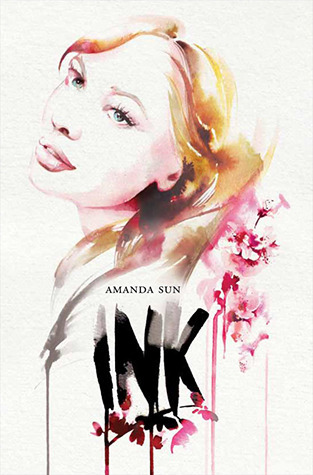 Take away the cheesy Japanese romance, Ink is still worth reading. It's fun, unique and overall entertaining. Hey Sab! Well I have to say that the cover of this book taunts me. It's been on my radar for a while, and I think that I will be unable to resist reading it. I am not a fan of insta-luv either, but when the plot is likeable, I have been known to overlook it. I enjoyed your review!